Some higher-end cars have displays on their console that can provide real time fuel economy. 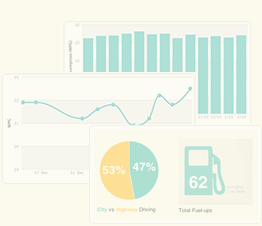 This is great for getting immediate feedback on how your driving style affects your fuel economy. If your car didn't come with one with a built-in monitor, invest in an after-mark device which can hook up to the OBD-II data port of your car (all cars 1995 and beyond have this port). An example is the ScanGaugeII ( http://www.scangauge.com/ ). It's easy to plug in, and use. I have mine set up to display my current speed, instantaneous fuel economy, the fuel economy of the current trip, and RPMs. When I drive, I strive to keep the instantaneous mpg reading higher than the current trip mpg number in order to force it up. Not only is this particular device useful for providing real-time information, but it can also scan your computers ECU for OBD error codes. This provides you with great amplifying information in case you ever get a check engine light (CEL). Recently, our van's fuel economy started to dramatically decrease, and it finally started throwing an intermittent CEL when starting. I was able to quickly diagnose the cause (cylinder #3 ignition misfire) using this OBD-II monitor. this tip works for 87% of voting Fuelly members.